While the East Coast of the United States was being battered by a legitimate “Storm of the Century” the 2012 World Series of Poker Main Event resumed last night in Las Vegas, with the final nine competitors returning to the Rio for the first time in over three months to play for the $8.5 million first-place prize as well as poker immortality as a WSOP Main Event Champion. From hand #1 the action was fast and loose, with the players making very few missteps during the opening level. In the second level of the evening two players were eliminated, Steven Gee and Robert Salaburu. 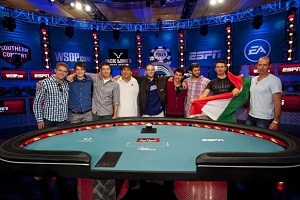 The first to go was Steven Gee who fired an all-in bet with perhaps the most polarized range of hands in WSOP history. With the board reading 4-5-7-J-3 Gee moved all-in after betting both the flop and turn and getting called by Russell Thomas. Realistically Gee had either pocket 6’s or nothing but a bluff-catcher. After some contemplation Thomas eventually called, showing Pocket Queens to eliminate the table’s elder statesman, who had Pocket 8’s. In the next level it was the short-stacked Michael Esposito who was eliminated, as the semi-pro player found himself in dire straits after making numerous pre-flop calls and seeing his stack dwindle. After the short level break, Esposito came back possessed with a new aggression (and better cards) and moved in three consecutive hands, winning the first two uncontested but running his AJ into Greg Merson’s AK the third time. Merson took Esposito’s chips to the top of the chip counts, supplanting Jesse Sylvia for the first time at the final table. The next to go was Andras Koroknai who was playing extremely tight throughout the early stages but really started to open-up his play, which he perhaps took a step too far when he 5-bet all-in with KQ, running into another AK of Merson. Koroknai’s 40 million chip blowup propelled Merson to the chip-lead again, this time with a big cushion. Next out was Jeremy Ausmus who played brilliant short-stack poker throughout to finish in 5th place. Ausmus was followed to the rail by Russell Thomas, who also played a terrific game at the final table, even challenging for the chip-lead earlier in the night. With Thomas’ elimination the final three was set, as 21 year-old Jacob Balsiger, cash-game grinder Greg Merson, and Jesse Sylvia will return Tuesday night to play for the title. All three played excellent poker throughout the final table and all have competitive chip-stacks which should make for a very interesting three-handed fight on Tuesday. This entry was posted on Tuesday, October 30th, 2012 at 8:43 am and is filed under Poker News. You can follow any responses to this entry through the RSS 2.0 feed. You can leave a response, or trackback from your own site. We knew going into the main event final table that Greg was our guy. We were proud to see him wearing our patch, and we’ve been celebrating here at DraftKings HQ all day long. Congrats, King Greg!